The Fordham Rams (FCS) wrapped up a stunning upset win over the Temple Owls (FBS) with this—there is simply no other word for it—breathtaking hail mary that traveled 125 yards in the air if it went 29. 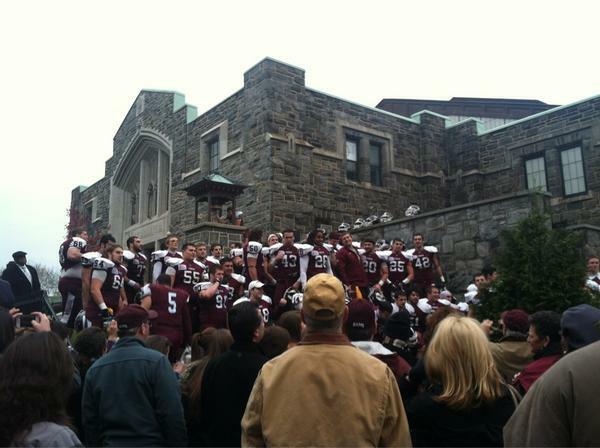 The Patriot League stalwarts are now 2-0 in the division and 3-0 on the season. Ring that motherfucking bell, Rose Hill. Update: Here is Mike Watts with the tremendous, gasping call on WFUV. Beautiful. Fordham head coach Joe Moorhead discussed his team's psyche and how he and his staff handled the emotions of being up on a superior team at the half. The Rams would, of course, relinquish the lead and have to fight back to win, but Moorhead was prepared.